I’ve been missing for two weeks. I’ve been elsewhere, and those of you who know me well will have figured that I was away in the European Alps, as is usual at this time of the year. I’ve just been sitting in front of the computer for two hours or so, uploading hundreds of new images and this is the first one processed. Perhaps not what you might expect from 10 days in Zermatt – home to the Matterhorn, which, if visible, would be just peeking over the horizon towards the right edge of the image. We had good weather, and not-so-good weather – this was one of the not-so-good days. But this was an image I really wanted to work on. I had viewed this line of trees in previous years (they are visible from our hotel bedroom across the valley); I probably walked past them about eight years ago. I have often thought: that would make a reasonable picture if I could get the right angle. It’s a fifteen to twenty walk to get to them and so one morning with the weather looking unsettled I decided to take a closer look. This year I made the decision to take two Nikon SLR bodies on holiday – an old D80 and a newer D7000 and two lenses: my ultra-wide 11-18mm Tokina and a 18-250mm Sigma. These lenses are a good pair, between them they just about cover every eventuality, but when I’m carrying just one camera body, I am constantly switching lenses; and in a harsh environment where there is always the risk of dust getting on the sensor, it’s a nuisance to keep uncoupling one lens and attaching another. And often I just can’t be bothered, with the result that I have probably missed loads of images in the past. So this year I have done most of my walking with two cameras slung round my neck. I don’t enjoy the extra weight but I’ve enjoyed the options that two lenses provide. I wonder how often you have seen a potential image some way off, envisaged how it would look, and then when you got close up discovered that finding the right point of view was difficult if not impossible. It happens. And this was one of those occasions. I envisaged the line of four trees against the sky – no competing ridge lines, just trees and sky. I looked from this side, and the other side. I stood well back, I got up close. I moved up and down the hill. I used both lenses. There was no position that enabled the image I had in mind. What you see above was the best view I could achieve after about fifteen minutes of trying. It had the bonus of bringing a fifth tree into view. I had an image, but I wasn’t too hopeful that I could extract a good picture from what I had captured. In colour the leftmost tree merged into the hillside in the distance. But, I had always ‘seen’ the image as having potential in B&W. And Silver Efex has delivered the goods as it so often does. There are, I think, 37 presets to flick through in Silver Efex. For any given image thirty of those will be rubbish, but there will always be a few that are promising and often just one that hits the sweet spot. And that is what I found with this image. One option gave me exactly what I wanted – tonal separation between the trees and the distant ridge-line, the right amount of contrast, and a powerful sky into the bargain. It’s so nice when it all comes together. This was shot at 22mm film equivalent, F16, 1/180 sec, ISO 320. More images will follow over the next days and weeks. 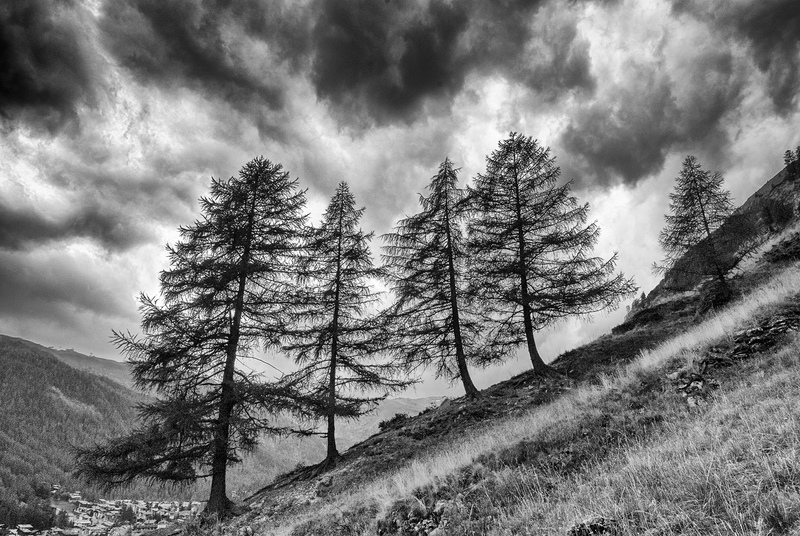 This entry was posted in Walking in the UK and tagged Black and White Photography, Photography, Silhouette, Trees, Zermatt. Bookmark the permalink. You really worked for this photograph, Andy! And it was well worth it. Very appealing, especially for the contrasts and range of tones. Bravo. Thanks Linda. I’m learning to slow down and ‘work’ to find images. When you know a place really well (like I know Zermatt) I am not always n a busting hurry to get to new destinations. I can enjoy pottering around and that is yielding results. All your work paid off in this shot, Andy. The D80 can still produce great images. I have one but I’m thinking of converting it to IR later this year. Nice work. Thanks Ken. The extra camera body adds unwelcome weight but it really does make a difference to working a scene. The D80 probably hasn’t been used for a couple of years but it worked fine. And all the standard controls are the same as on the D7000 which makes swapping from one camera to the other easy. Bravo! Although this image may not exactly represent the initial shot you envisioned, I hope you’re still thrilled with the result, Andy — because it’s a stunner. Gorgeous work, and congratulations on your perseverance. Hi Heide. Yes, I am pleased with the result. It’s always encouraging when an idea works out, or nearly so. Marvellous! Looking forward to more, Andy! The fifth tree is precariously placed for sure. One of the things that always amazes me about trees is their capacity to grow in the most unlikeliest of places – in boulder fields, out of almost vertical ground. I think that fifth tree is actually quite important to the composition, it acts as a ‘full stop’ (you would say ‘period’) as your eye moves across the image. It is nice indeed when it all comes together…the glow it gives you for a while…so delicious for the soul. Well done, such an engaging photo. Thanks Paula. Ah yes – when you flick through Silver Efex presets and you come across one that really delivers, that is such a satisfying moment. As with this image there is still work to do but the foundations are laid. Linda said it all in her comment. You sure worked hard for this one. But isn’t that the way of most images. Its rare that the perfect shot appears on cue. I like the light sky (or cloud cover?) behind the silhouette of trees. I can see the township down in the valley in the lower left and will look forward to seeing some more from your holiday. I also bought a second camera body because I got fed up with changing lenses outdoors, and in my case, it was after a couple of walks down the local beach. I’d just started my (amateur) Photography hobby and was actually getting a little paranoid about getting salty sea spray or sand inside the body. Thanks very much for your comments Vicki. Walking and photography are not easy bed-fellows. If you have a destination to reach then the luxury of taking fifteen minutes to get a perfect shot is something that, if repeated several times through the day, may well mean the destination is never reached. Having a day or two devoted to photography means you can really slow down and concentrate – and the results come. Sensors are magnets for dust, and sensor cleaning isn’t cheap. Since I have chronic illness and pain and had to quit working in 2010, I’ve found setting off for a walk and stopping every 15-20 feet is the perfect ‘hobby’. I don’t have the luxury of necessarily a destination, or a set goal, or plan (like going to the beach to photograph the sunset for example). I just go to the beach or nature reserve or local pond and photograph whatever takes my fancy on the walk. If I see a bird or flower I might try from various angles and DOF, but basically, its ‘A walk with my Camera’. Sometimes I’m lucky. Sometimes I’m not. Having poor eyesight also means I love the anticipation of downloading the afternoon’s shots and being totally surprised by some of the subjects I’ve captured in reasonable focus is part of the thrill of photography for me. I envy you being able to go somewhere with a specific goal or destination and being technically proficient in the camera’s settings to capture ‘your vision’. Sorry Vicki, I’m slow replying to your comment – life has been hectic since my return home. Moving slowly will often yield images that the fleeter-footed will fail to see. Certainly photography is a hobby that can accomodate people with a disability, and can result in images equally as good as those taken by the able-bodied. I’m very fortunate to remain fit into my eighth decade and I still enjoy long eight-hour hikes, but equally I am finding so much pleasure in the slow-paced stroll. Fantastic shot ~ and looking for more from the European Alps. While you were searching for the shot where a line of four trees against the sky (no competing ridge lines), I think the falling valley below adds to the ‘movement’ of the trees, makes it a more dynamic photo. Thank you so much for your comment. Trees erupt from steep slopes in the Alps that often makes one think: how so they survive and acquire the nutrients in that position. And yes, the situation does feel dynamic, as you say – as if one day they will slide down into the valley below. You are too kind, Frank! Thank you so much. The thanks really should go to Nik – I promise you there has been no additional work on the sky after running this image through Silver Efex – this is what I mean by finding the ‘sweet spot’ – a visual ten out of ten. There was some extra work to clone out an overlap between trees 4 and 5 and to tone down the roofs of Zermatt in the bottom left corner. Thank you so much Lynn. This was one of those holidays when I (mainly) set aside ambitions to reach distant destinations and adopted a more inquisitive, pottering about, attitude to life in general. And it paid off. And this is a prime example of taking time over a single image. What really surprised me when I processed this image was finding a preset in Silver Efex where the sky suddenly completed the picture, strikingly. It was, very definitely, a ‘wow’ moment. I loved the composition! The photo in black and white resulted very well!